Petite Anse Hotel has always strived to make a positive difference to the community. Our efforts started on day one when we hired local consultants and then local builders to construct the resort. We have continued to hire local people, source local produce and promote local artists as much as possible. Our support of the community manifests in many different ways. Annie is particularly interested in helping the local community and has contributed significantly with her nursing knowledge from the UK and with her counselling techniques. We also feel that the hotel has made an overall positive impact here in terms of economics. We hire local people to run the hotel who pass through a training and personal development program. We want our staff to be self-sufficient and resourceful long after their time at the hotel. We also support the services of other local people such as taxi drivers, boat owners, tourist guides and a blind masseur. Almost all of our fresh produce is either grown by ourselves or purchased from local trusted growers. We actively support the protection of leatherback turtles and other wildlife in the area. There are many children in Grenada who have started life with a disadvantegous family situation. Father Mallaghan’s Home for Boys in Victoria has homed many of these children. These boys have grown and passed through the home and some of them are now successfully independent. The stability and sanctuary of the home has provided them with posittive relationships with people who have guided them away from the deprived beginnings that they may have had to endure. The home gives them space to dream and then grow and stay standing. Annie has tirelessly supported the home and encourages returning guests to ‘pack for a purpose’ which is incredibly successful and makes SUCH a difference to the local children and the orphans at Father Mallighan’s Home for Boys. By bringing essential items such as school pens, pencils, stationary and much needed items of clothing such as boxer shorts (which can be multi used as pyjamas, swimming trunks and underwear!) the difference it makes to these children is enormous. Providing a service to amputees who are looking to improve mobility by use of a prosthetic aid, Attach A Leg is a non-profit organisation. 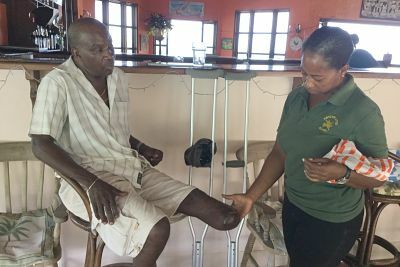 Petite Anse is currently looking at ways to support this charity who are performing a much needed role on the island. Head over to their site to read more about them by clicking here. Philip is also running the London Marathon to raise funds for Attach-a-Leg – please make a donation here. Philip raising funds for the new roof of the local Leonard Cheshire home in Sauteurs. Petite Anse Hotel regularly makes charitable contributions to both local people in need and projects. 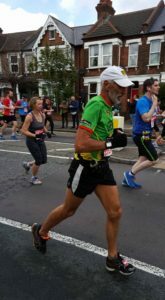 Philip recently ran the London Marathon to raise funds to replace the deteriorating roof of the local community home – with the help of our guests and other contributors, he raised over US$17,000. If you’d like to make a contribution, please ask.